These two stocks look poised to stand the test of time -- and reward investors while they're at it. When it comes to risk, not all stocks are created equal. Different factors -- namely, business quality, investment predictability, and valuation -- simply make some stocks less likely to underperform than others. Unsurprisingly, risk-averse investors are particularly interested in stocks with lower chances of underperforming, so these are important factors for low-risk investors to consider. Fortunately, there are a number of stocks that score well on these factors that investors can buy today. I believe Walt Disney (NYSE:DIS) and Berkshire Hathaway (NYSE:BRK-B) (NYSE:BRK-A) are two. Here's a look at how each of these businesses fares when it comes to business quality, investment predictability, and valuation. Disney and Berkshire represent two of the highest-quality publicly traded businesses. The quality of their financials is arguably indisputable. 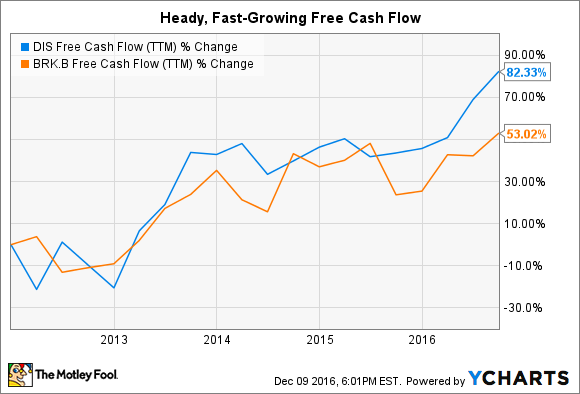 Not only do both companies have very strong balance sheets, but also their propensity for generating excess cash has only improved in recent years, highlighted by Disney and Berkshire's rapidly rising annual free cash flow during the past five years. Further, each of these companies has strong durable competitive advantages, positioned to help them sustain strong financial positions and per-share intrinsic value growth over the long haul. Disney benefits from both the scale at which it can deploy and benefit from its media assets and the underlying brands of those media assets. Between its parks and resorts, entrenched relationships with cable networks, consumer products, and increasing mobile distribution, Disney can scale the distribution of its timeless, diversified content, including ESPN, Pixar, Marvel, Star Wars, and the world-class Disney brand itself, in a way other media companies simply can't match. With famed investors Warren Buffett and Charlie Munger at Berkshire's helm, it's no surprise the company's holdings include some of the lowest-risk, most sustainable companies in the world. After all, Buffett literally coined the term "economic moat," which captures the idea that a business' competitive advantage should serve as a moat in a similar way a castle's moat keeps its enemies at bay. The wider and deeper this moat, the better, Buffett argues. Berkshire Hathaway's holdings benefit from a range of economic moats, including scale, cost advantages, network effects, high switching costs, and brand power. Great examples of high-quality Berkshire subsidiaries include Geico, Duracell, Nebraska Furniture Mart, and Burlington Northern Santa Fe Railway. And its top stock holdings include enduring names such as Coca-Cola, American Express, and Wells Fargo. When it comes to investment predictability, Berkshire Hathaway is arguably the gold standard. Buffett is known for his tendency to prefer investments in simple, understandable businesses. Further, the majority of Berkshire's investments have long track records of profitability. Disney's business is arguably much more difficult to predict -- especially in the near term. With over half of Disney's operating income coming from a single segment, media networks, the company is highly dependent on the segment's success. And the risk in this segment is magnified when investors consider the bulk of Disney's media networks segment comes from a single program: ESPN. If ESPN faces challenges, therefore, these challenges will materially affect the company's bottom line. But the powerful brands under Disney's name, including ESPN, have incredible staying power thanks to their long-standing popularity with consumers. So while there's a good chance investors may see near-term volatility with ESPN or the company's blockbuster-driven movie segment, the powerful brands driving these segments' results are here to stay. Further, Disney's investment predictability benefits from both a long track record of success and the fact that the company's business model is simply easy to understand. Helping lower the risk of investing in these stocks, both Berkshire and Disney trade with conservative valuations. Berkshire and Disney's price-to-earnings ratios of 17 and 18, for instance, are relatively cheap considering the backdrop of their average annualized five-year EPS growth of 13% and 18%, respectively. Overall, both investments are great examples of stocks for low-risk investors. While Disney's valuation is arguably cheaper than Berkshire's, considering the company's recent growth and its continued growth potential, Berkshire -- with its diversified set of enduring assets -- beats Disney when it comes to investment predictability. And both companies get a 10 out of 10 when it comes to business quality.